Ferrari and Ford have a few issues. It all stems from the world of motorsports, when the Blue Oval brand was eager to dethrone the Italian house of Enzo at Le Mans. Eventually, with the help of the world’s most famous chicken farmer, Carroll Shelby, Ford took top honors at one of the world’s greatest racing events. Some mad vehicular scientist has decided those two automakers need to get a bit more cozy. The result of that thought is an automotive mash-up we can bet you didn’t see coming. What we get is a 1932 Ford that has received a number of upgrades. The most notable is the 3.0-liter Ferrari V-8 engine that is mounted in the exposed snout. Not content with that splash of late 80’s Italian power, the builder added a pair of turbos to aid in breathing. 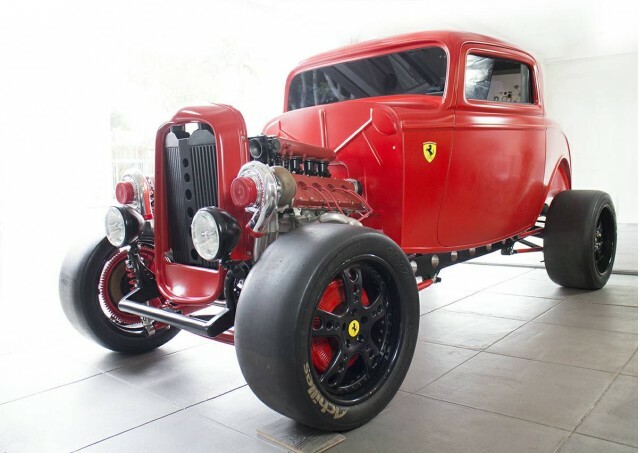 This 1932 Ford now boasts an 8,500 rpm redline and an estimated 950 horsepower. Inside you’ll find a full roll cage, racing seats, and digital gauges. Outside, you’ll be happy to hear that the rear end features independent suspension and massive disc brakes. Up front, those drum brakes are actually hiding another set of disc clampers for proper stopping power. Do you like this monstrous mash up? You should, because it’s outside the box and oh-so awesome. Unfortunately, it’s also wickedly expensive. The asking price is $250,000.